The places that represent Latino and Hispanic history are incredibly varied—architecturally, geographically, and in terms of their impact on American society. Some sites were integral to the 20th-century farm workers’ movement, while others represent religious tolerance in a diverse community. Still others maintain visible marks from the artists who painted on their walls, and many sites were at one time frequented by famous guests. To shine a light on such places, the Hispanic Access Foundation’s Latino Heritage Scholars released the 2017 Place, Story, and Culture Report, which documents 10 significant places in Latino history worth preserving. Many of these places already are in the process of being saved, thanks to community-led, grassroots efforts, and are ready for the next step of national recognition. The report was created by scholars Manuel G. Galaviz, Norma Hartell, and Ashleyann Perez-Rivera, and it includes a range of places like Rio Vista Farm in Socorro, Texas (a National Treasure of the National Trust), Santa Rita Hall in Phoenix, Arizona, and Pueblo of Tortugas in southern New Mexico. Site selection was based not only on these places' contributions to Latino and American history, but also on their likelihood of receiving additional protections. 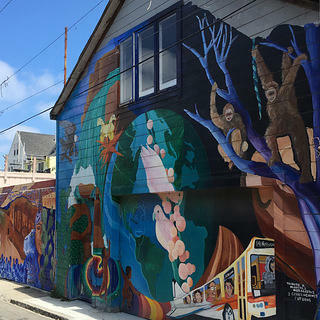 Below, read about three of the listed sites in California—Balmy Alley, Forty Acres, and McDonnell Hall—that reflect significant moments in Latino history and continue to provide support for their communities. 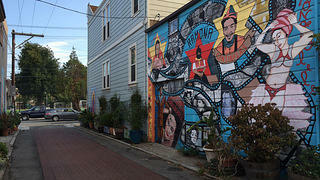 Famous and unknown figures line Balmy Alley in the Mission District of San Francisco. In addition to its famous murals, Balmy Alley is also the site of a famous 1960s court case. Seven young Latinos, called Los Siete de la Raza, were accused of murdering a police officer in the neighborhood in 1969. All seven were acquitted, and the historical moment was a victory for an intersection of the Latino community, Black Panthers, and other group fighting for social justice. Balmy Alley’s murals—and the stories that surround them—are ephemeral, and the neighborhood is facing threats of gentrification. Balmy Alley’s community, as well as local historical societies, are currently pushing towards nominating the site as a National Historic Landmark. McDonnell Hall's humble exterior doesn't reveal its immense impact on its community and national history. 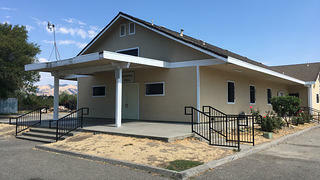 First built in 1914, Our Lady of Guadalupe Catholic Mission Chapel (more commonly known as McDonnell Hall) was originally the home of the Saint Martin of Tours Catholic Parish in west San Jose. But as Latinos began moving to central California in the 1930s and ‘40s, a growing need for Spanish-speaking Catholic churches brought priest Father Donald McDonnell to the area. In the early 1950s, McDonnell moved to Sal Si Puedes (“Get Out If You Can”) in East San Jose and soon after addressed the segregated barrio’s need for an easily accessible spiritual center. He purchased McDonnell Hall from the Saint Martin of Tours Catholic Parish and physically moved it to Sal Si Puedes. According to scholar and historic consultant to the Cesar Chavez Special Resource Study Ray Rast, “the building itself was sawed in half and loaded onto trucks” before being relocated to its new home. Rast explains that McDonnell Hall “reflected a Catholic investment in America. We needed our churches to support us.” The church was the only enough space for civic gatherings in the barrio, so community members like Mexican-American civil rights leader Fred Ross went there to organize and connect to other strong voices in the movement. McDonnell Hall and other parishes sent food, clothes, and aid, to activists in their communities; they often helped organize marches. Reuther Hall, the meeting hall on the Forty Acres property in Delano, California. Forty Acres is a National Historic Landmark located in Delano, California. Its significance is based less on its architecture than on its rich history—according to Rast, it was the “unsung hero of the farm workers’ movement.” Richard Chavez, Cesar Chavez’s younger brother, spent much of his life cultivating what eventually became Forty Acres. The property was first used as a gas station, which reflected the needs of the Latino laborers who lived and worked in the area. It later included a clinic that provided affordable healthcare to the farm workers and the Paolo Agbayani Retirement Village for aging Latino and Filipino laborers who had nowhere else to go. These and other buildings on the property fulfilled needs that, at that time, were being ignored by farm workers’ employers and the U.S. Government. Cesar Chavez and Dolores Huerta, heads of the United Farm Workers Organizing Committee (later the United Farm Workers of America Union), purchased the property in 1966. Forty Acres became the union’s headquarters—the first agricultural labor union in the United States. Chavez and other union members organized there to create the California Agricultural Labor Relations Act of 1975, which recognized the collective bargaining for farm workers in California. He even performed his last public fast there in 1988 to protest unsuitable labor conditions.